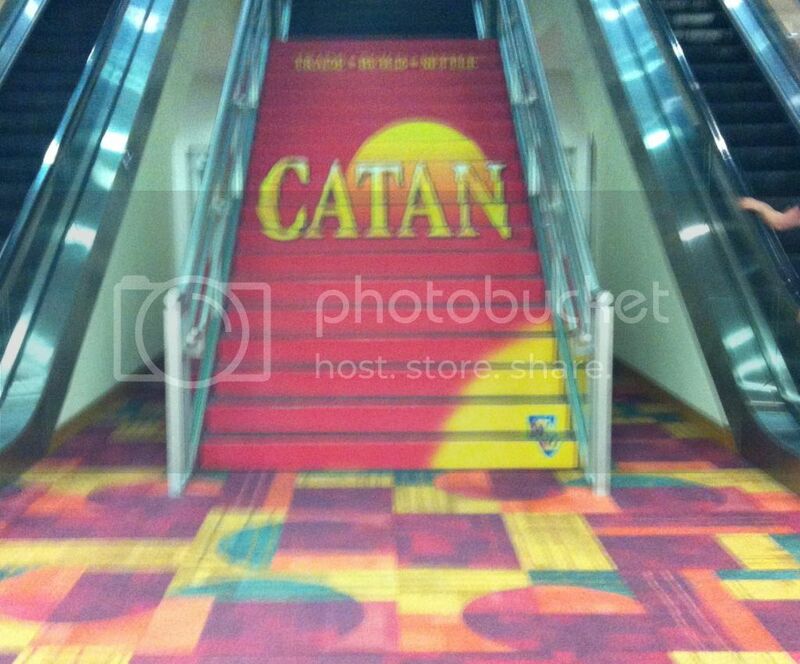 OK - the official start of Gen Con! 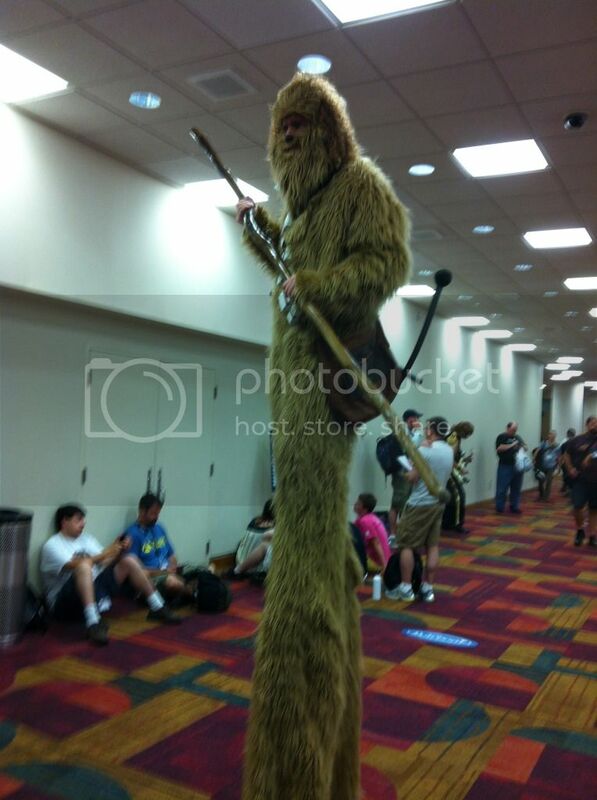 Gen Con Indy is the original, longest running, best attended, gaming convention in the world. 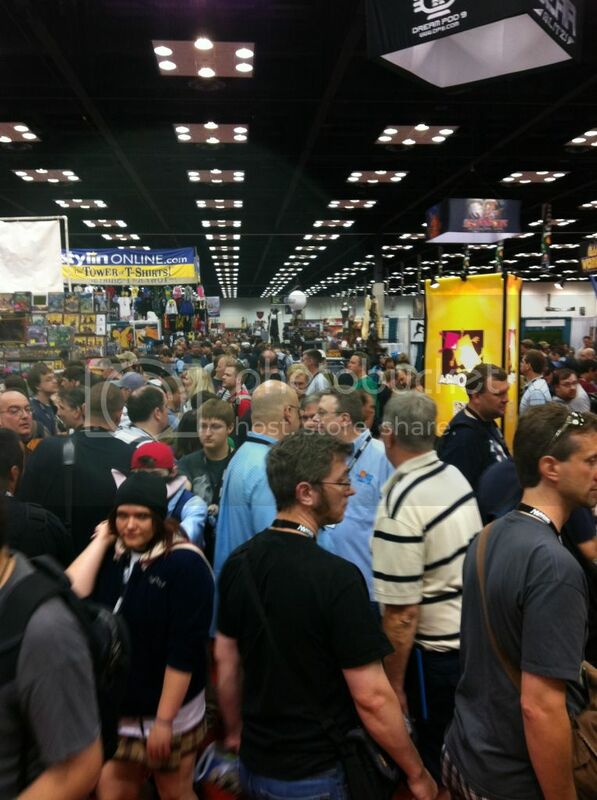 For over 45 years, Gen Con has been setting the trend and breaking records. 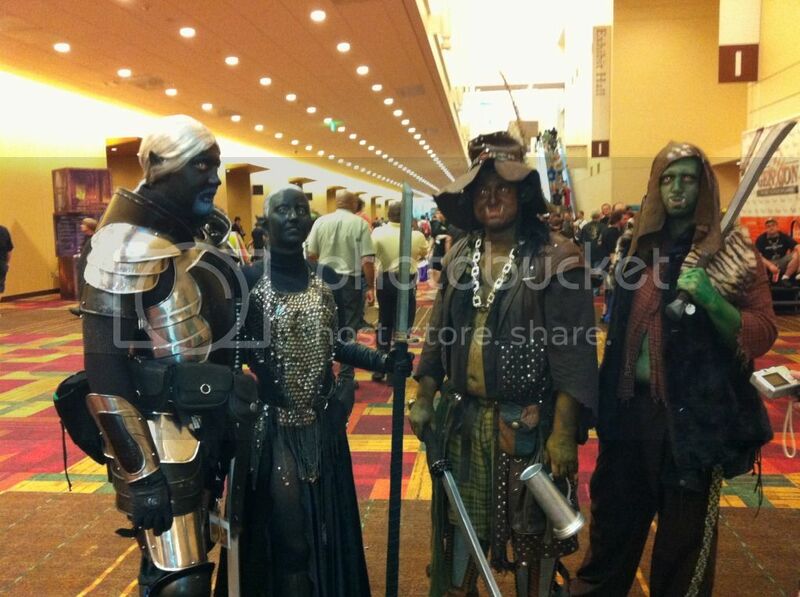 This year, more than 134,775 turnstile and over 41,000 unique attendees experienced Gen Con. 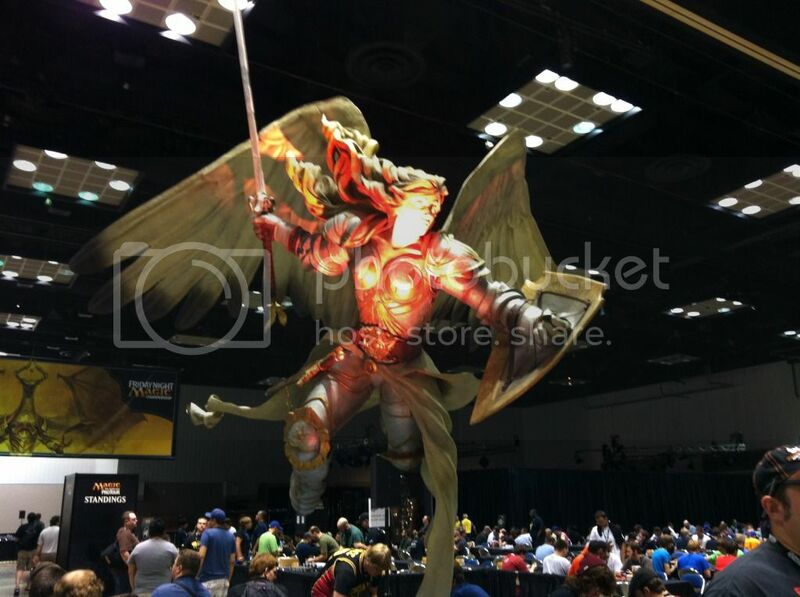 Nearly 9,000 events ran as part of GenCon, with players from at least 71 different countries participating. Man - there is so much to do here! Of course I go in with a tightly packed schedule of pre-determined events, and even the scarce free time is jam packed with important ventures into the dealers hall. This is no small thing people. I planned on 2 hours to check out the hall. NOT ENOUGH TIME. 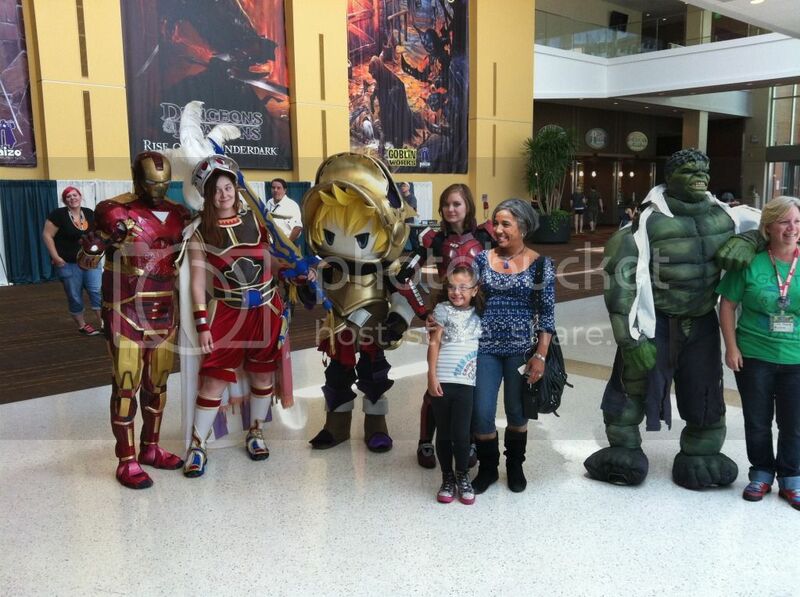 Most of the actual gaming takes place in the rest of the convention center. If I haven’t stressed enough how big Gen Con is - remind me to show you the phone book size catalogue of events. Type is so small it’s hard to read and there are many hundred pages stuffed with all kinds of fun stuff. Too much to do is an understatement. It would be impossible to do 1%, much less all of it. Of course the game I focus on most is Star Wars Miniatures, and even within that small percentage of Gen Con that features this game, there is still too much to do. You have to pick and choose. I’ll pick now to give a whirlwind synopsis of the game of Star Wars Miniatures. Star Wars Miniatures is a game consisting of miniature models of Star Wars characters, each with a corresponding stat card. The card tells you what the figure can do. (Don’t sweat the details if you’re not a gamer, just get the gist of it, you dig?) Each figure has a COST (top right corner), and that’s how many points it costs to put that character on your team. The game originally started at the 100pt level, which meant that you could have 100pts worth of characters on your squad (ie a few big badasses, or a whole bunch of little weenies, or any balance thereof consisting of 100 or less points.) Like all gamers, we all want more! Soon 100pts was deemed to be not enough, and most tournaments ran with 150pt squads. Then eventually we gravitated to where the championship level is at now, 200pts. Each squad may consist of characters from one faction (Rebel, Imperial, etc) of which there are 9, and add any fringe characters to it. Those fringe characters will work for anyone. But no, you can’t build a team with both Darth Vader and Han Solo in it and play it in a tournament. You get you’re squad, and you bring it to the tournament, and you use your same squad throughout. If you have built your squad well, it will be able to compete against most any squad. You need to carefully find synergies between characters and balance tech and power to achieve victory. A large part of the game is simply building your squad, but then you also have to play it well too. The object of the game is to maneuver your team around a map and engage your opponents team and destroy them, using your characters stats and a D-20 (20 sided die). The game was produced by a company called Wizards of the Coast from 2004-2010. In that time they created 790 unique sets of stats, and (for example) in my collection alone I have over 3000 miniatures. Many combinations to choose from. The game had such a fervent fan base that we refused to call it quits. We not only continued to play the game, but we formed a committee to produce new cards with unique stats to accompany existing miniatures to open up all new possibilities. I have been involved with this process and am currently on the play-test committee, where we try and see if a character can be abused. We had these "v-set" cards professionally printed and distributed to our community, and had them available for anyone to download for free. We just released the fourth “v-set”, adding to date 274 more unique stat sets to those that Wizards of the Coast created, and since we are running the show now, we have made them legal for tournaments too. yours truly won it in 2009 and 2011. Just the facts folks (I gotta cling to something). Well this year it was slated for Thursday, and they tried to shake things up a bit. Instead of straight 100, 150 and 200 pt tournaments - they did some different stuff. They included a “Mystery Map” tournament in which you play on a brand new never-before-seen map. I'll be honest, I have not enjoyed this tournament in the past. Others love it - I guess it's just not for me. They also dropped 100pt from the roster all-together. Then they added a tournament where you can only use the v-set characters. Sounds like a fun idea, but I’m a bit of a purist and didn’t think it should be part of the Jedi Challenge. So I chose not to do the Jedi Challenge. That was the main focus for Star Wars Miniatures all day Thursday, so for the first time ever, I spent a whole day at Gen Con NOT playing ANY Star Wars Miniatures. Tough decision, but I stand by it. Not only are there lots of other games that I like and wanted to play, but this also meant I’d be a little more fresh on Friday for the World Championship. The Jedi Challenge is grueling, and mentally exhausting. Besides, I had won it half of all the times it was ever run, so let someone else win it - right? So perhaps this was the better choice for me. So what did I do instead? Ascension!!! Anyway - They have 1 original “base” set, 1 expansion, a second “base” set, and they were debuting a second expansion set at Gen Con. I decided to enter 2 tournaments on Thursday for Ascension; 1 with the original base set and the first expansion, and 1 with the second base set and brand new expansion. I didn’t have high expectations, I figured I’d end up middle of the pack, but still have fun. They played 3 rounds and then cut to a final 4 for the last round. I actually did better than I expected, I made the final four in the first tournament and ended up a close 2nd place overall. Nice. In the second tournament I barely slipped into the final four as well. 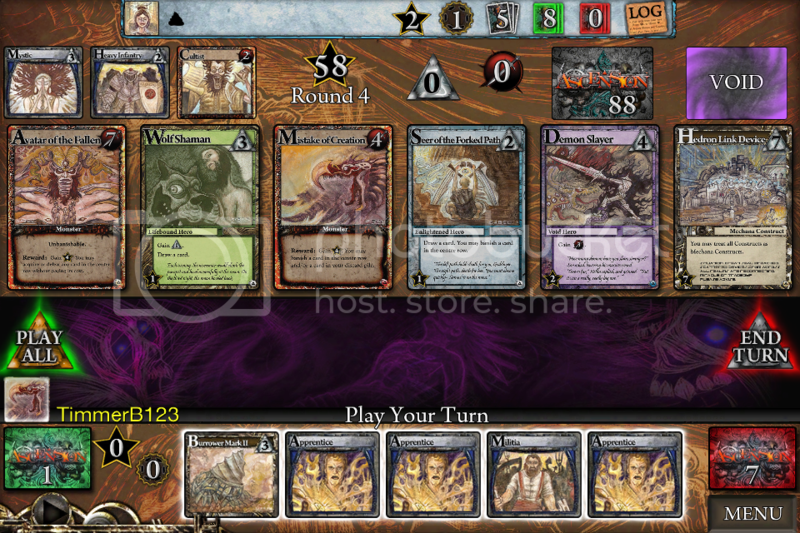 I had a rough final game but I was just happy to make the final four in BOTH Ascension tournaments. This is a picture of the last round before the final 4. Me, my buddy Mark, and TWO girls! Yes, girls actually play (and do well) at this game. 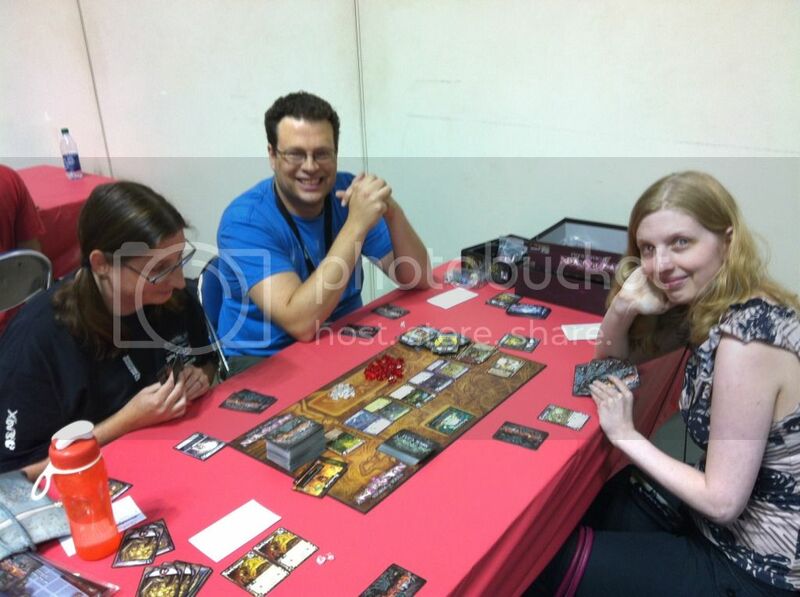 Female gamers are in short supply, even at Gen Con I’m afraid. Star Wars Miniatures has never seemed to have more than a one or two females involved at any given time. But I will say those that do play are more awesome than words. Go girl gamers! I also spent a little time checking out random freaks and geeks (I say that out of love) in costume. 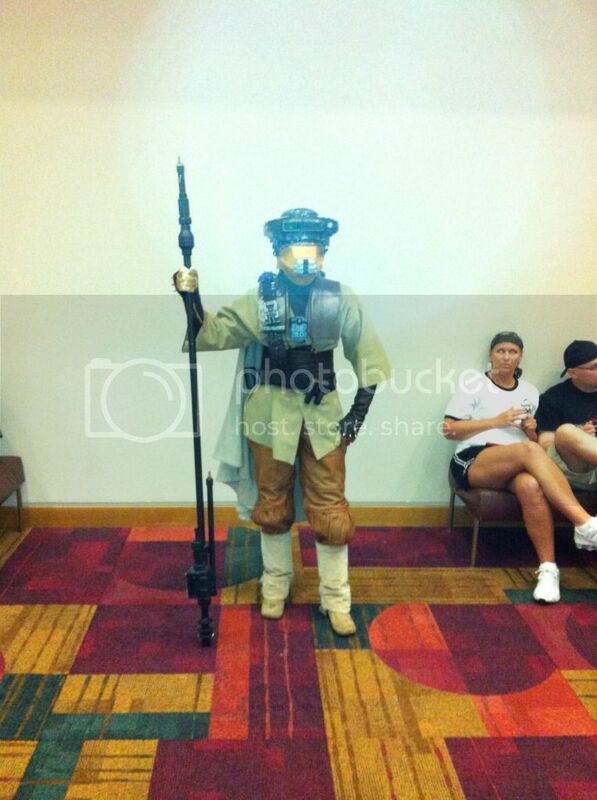 Princess Leia disguised as Boushh. 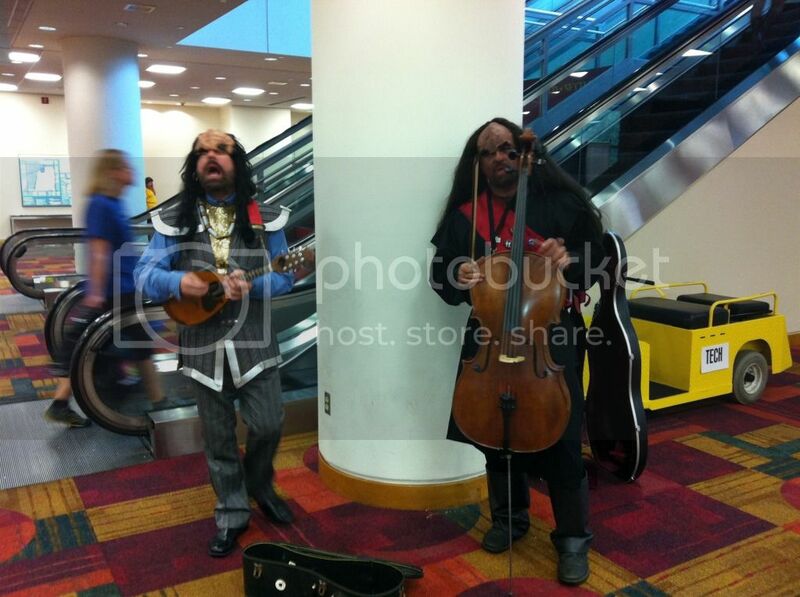 So that pretty much wrapped up my Thursday at Gen Con. Congrats to Trevor Payton for becoming only the 4th ever Jedi Challenge winner in history. Nobody had ever won the Jedi Challenge AND the World Championship, much less in the same year - so by my estimation he cursed himself. Others insisted on staying up all night doing casual gaming, but I got a halfway decent night sleep for the big day on Friday. I made sure to put my squad for the world championship under my bed because I heard that was supposed to bring you good luck. I didn’t believe it, but I wasn’t going to NOT do it, just in case! I also skipped the Jedi challenge this year (the mystery map turned me off to this tournament last year) and joined Tim for some Acension gaming. In the 1st tourney, (1st set, and 1st expansion) I did poorly, middle of the pack somewhere, hoping for so much more. In the second tourney, I just missed out on the final 4. In the last round, I was at the same table as Tim, and we finished that table 1 and 2. Tim beat me by a few points, thus making the final 4 while I got to sit on the sidelines. Oh well I got Tim back on Saturday in Tile Wars and the Sith Trials. (Saturday was an all around great day for the Chicago gamers.). But Tim will post his Saturday results later. I'm glad I'm not the only person stuck on Ascension! Your picture says it all, my main Opt. is my wife. She will beat you! Great story awesome pics thanks! My older two kids and I really enjoy Ascension. In the big tourney on Saturday, I took the Tim'th place (9th Place) out of 130 ish players.